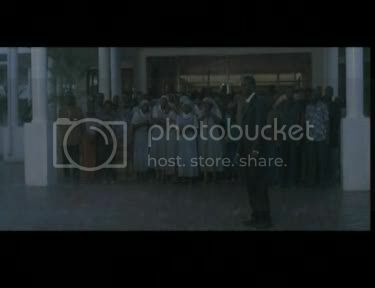 Hotel Rwanda is the emotionally wringing real-life story of Paul Rusesabagina, a hotel manager in Kigali, Rwanda, who saved the lives of over a thousand people during the 1994 genocide. Immediately similar, then, to Schindler's List, the film is a straightforward story of a common man's bravery in the face of the worst horrors. 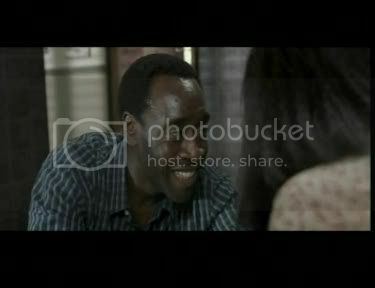 The excellent and lovable Don Cheadle as Paul. Like Liam Neeson's Oskar Schindler, Paul (Don Cheadle) is introduced to us as a succesful and charming manager of Kigali's luxury hotel, the Sabena Hôtel des Mille Collines. He's the sort of man who doesn't want to stick his neck out in political matters. Instead, earnest and diplomatic, he easily trades bottles of brand-name liquor for personal favors with the visiting diplomats and military leaders. While the (some would call them artificial and colonial remnants) ethnic tensions between the majority Hutu and minority Tutsi groups come to a boil, Paul assures his friends and family that there's nothing to be worried about. "The UN is here!" he says optimistically. "The whole world is watching!" This is just painful to hear, as the UN's failure in Rwanda has since become infamous. Indeed, when Hutu President Juvénal Habyarimana is assassinated, the situation suddenly deteriorates into open civil war. Paul is inadvertently thrust into a significant moral position when his neighbors flee to his house for help. He takes them to the hotel for safety and, day by day, the group under his care grows to over a thousand people. Paul must then use his depleting resources for bribes and depleting diplomatic charm to ensure their survival. The film is a very straightforward narrative, told simply and clearly. We think its greatest value is that it educates the typical American viewer in the 1994 genocide - much of the dialogue is either straight exposition ("I'm Hutu, but you are Tutsi," Paul tells his wife, Tatiana (Sophie Okonedo), apropos of nothing) or political/historical commentary in a nutshell. For example, two important issues - the UN's inability to act and the suspected racism which stymied international intervention - are bluntly vocalized by various characters. An iconic scene, which reminded us of the similar "evacuation of white expats in times of local crisis" scene from The Killing Fields. 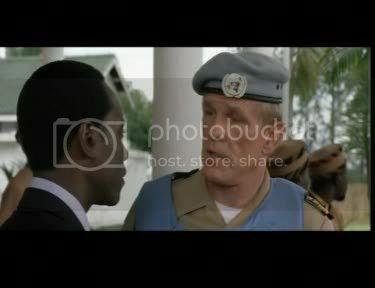 Nick Nolte as the token powerless UN official - complete with no Belgian accent, whatsoever! REPORTER: I think if people see this footage they'll say, "oh my God that's horrible," and then go on eating their dinners. Later, the exasperated UN colonel (Nick Nolte) continues along the same vein: "You're black. You're not even a n****. You're an African." And finally, Paul's Belgian boss (Jean Reno) calls the Western governments "cowards" who don't care about what happens in Rwanda. We think it's notable that only white characters vocalize this opinion, because we think it's a cunning way to shame and sympathize the predominantly white American audience which would watch this film. That is, call us horribly cynical, but we think had the black African characters said these things, a white American viewer might have remained skeptical and perhaps even dismissed them as just theories or oversensitivity. Instead, since it is always a white character which acknowledges this shameful possibility, there can be no doubt because it is a self-condemnation. And indeed, the 1994 genocide is a terrible and shameful reminder of the Western world's inability to stop something from happening... even when they knew it was happening! For more information on the genocide, we recommend Philip Gourevitch's book, We Wish to Inform You That Tomorrow We Will Be Killed With Our Families. One of many ultra-tense scenes when Paul has to schmooze to survive. Don Cheadle grounds the film as the everyman hero - he's not hell-bent on bravery (indeed, in early scenes he waves away his wife's suggestion to help a neighbor since that neighbor's "not family"), but he is, deep down, a good man, and when he finds himself in the position of protector, he accepts it. It's wonderful to watch Cheadle as he uses his diplomatic cunning to get answers, information and favors from various characters. And, of course, Cheadle has several poignant moments when, in private, Paul can fully express his horrified grief (e.g. the scene when he can't get his tie on). The rest of the cast is good, though less effective in that they are roughly sketched stereotypes - the good wife, the harried UN official, the cynical reporter. The performances which left most of a mark on us were Fana Mokoena as General Bizimungu, who was terrifying in his hot-cold attitudes, and the unexpected cameo by Jean Reno as the Sabena Airlines President in Belgium. "Why don't we ever get to hear the starving African kids say something or do something or sing something or express something? We show them but they don't have a voice." Right now, we at the PPCC are definitely feeling that we're not hearing the real voice of Africa. We're only seeing non-African perspectives of the continent, and they're all focusing on the worst aspects. Apart from Nollywood, which a Nigerian friend promised to show us back in the day (and we're still waiting, you! ), can anyone out there suggest something to soothe a curious soul? Teach us, Internet! I have nothing to recommend for African cinema which leads me to second your call for some Nollywood! I am also dying to get my hands on popular Egyptian films - but it seems like a lot of these films are not subtitled into English and impossible for non-Arabic speaking me to track down. well, there's always "The Gods Must Be Crazy" and its sequel, which are fabulous and fun films. I loved this movie, although the whole thing made me sob (and was the only thing that made me write to the White House during the Clinton years. At least he had the grace to apologize later, but...). And the book you refer to is really good too, as is Fergal Keane's first-hand account. I think the Christian Science Monitor has the best media coverage of Africa in general. More than 500 people have died from cholera in Zimbabwe in the past couple of weeks and you never hear about it in the American media. Sigh. Thats so true about the voice of Africa (or lack of it) - everytime Africa comes up in movies its either starving kids and brutal slayings or exotic tribal dance routines! 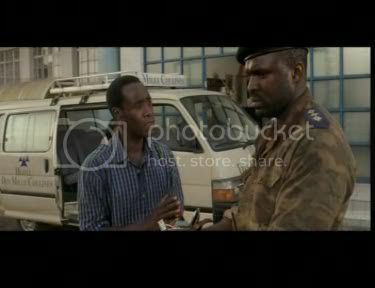 I'd like to get hold of some genuine African movies, too. Still, there is something to be said for movies that talk about the exploitation of Africa and Africans by the West (the Constant Gardener, Blood Diamond, etc.) - a centuries old problem that is finally getting its due. Actually, Memsaab, I just heard about the Zimbabwe thing again on NPR this morning, but maybe it doesn't count as American media. ;-) It is pretty out of the mainstream! Totally agree with memsaab "The Gods Must Be Crazy" is a wonderful movie. Though very simple but totally hillarious. Get to see some of these movies few and far between. But it took two or three weeks for them to cover it, I'd heard about it a week or so earlier in the Indian media. Hmmm, this must be why I could never really get into the non-Cheadle bits of this movie. I pretty much cried all through this movie but be it this one or Syriana or others of their ilk, I never really connect with white characters talking about how terrible everything is. Not because they're white, I don't think (I hope not anyway) but because these movies generally do such a good job of showing the actual people involved and what they're going through. As far as actual African movies are concerned - like FilmiGirl, I too am looking into Egyptian movies. Ebert recommends The Band's Visit this year. And like Memsaab, The Gods Must be Crazy is the only South African movie I've ever seen (and I didn't even know it was South African until now). Also Sarafina which is I guess sort of South African once removed? I almost saw Yesterday when it came out but then decided I didn't want to cry that day and gave it a miss. Here's the wiki page for South African movies. PS - Have you seen The Interpreter? it's like A Wednesday set in the UN with Africa as its focus. Weird but oddly compelling.